The world is largely known through the senses. The sense of sight is one of the most important senses. Through it we see mountains, rivers, trees, plants, chairs, people and so many other things around us. We also see clouds, rainbows and birds flying in the sky. At night we see the moon and the stars. You are able to see the words and sentences printed on this page. A polished or a shiny surface can act as a mirror. A mirror changes the direction of light that falls on it. Can you tell in which direction the light falling on a surface will be reflected? Let us find out. Fix a white sheet of paper on a drawing board or a table. Take a comb and close all its openings except one in the middle. You can use a strip of black paper for this purpose. Hold the comb perpendicular to the sheet of paper. Throw light from a torch through the opening of the comb from one side . With slight adjustment of the torch and the comb you will see a ray of light along the paper on the other side of the comb. Keep the comb and the torch steady. Place a strip of plane mirror in the path of the light ray . After striking the mirror, the ray of light is reflected in another direction. The light ray, which strikes any surface, is called the incident ray. The ray that comes back from the sur face after reflection is known as the reflected ray. A ray of light is an idealization. In reality, we have a narrow beam of light which is made up of several rays. For simplicity, we use the term ray for a narrow beam of light. Draw lines showing the position of the plane mirror, the incident ray and the reflected ray on the paper with the help of your friends. Remove the mirror and the comb. Draw a line making an angle of 90� to the line representing the mirror at the point where the incident ray strikes the mirror. This line is known as the normal to the reflecting surface at that point . The angle between the normal and incident ray is called the angle of incidence (∠i). 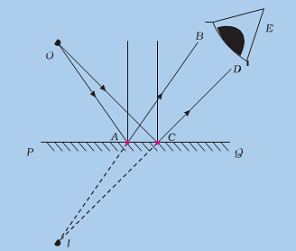 The angle between the normal and the reflected ray is known as the angle of reflection (∠r) . Measure the angle of incidence and the angle of reflection. Repeat the activity several times by changing the	angle of incidence. Record the observations in a table . There is a relation between the angle of incidence and the angle of reflection. If the experiment is carried out carefully, it is seen that the angle of incidence is always equal to the angle of reflection. This is known as the law of reflection. Let us perform another activity on reflection. Perform the above Activity again. This time use a sheet of stiff paper or a chart paper. Let the sheet project a little beyond the edge of the Table. Cut the projecting portion of the sheet in the middle. Look at the reflected ray. Make sure that the reflected ray extends to the projected portion of the paper. Bend that part of the projected portion on which the reflected ray falls.You will be able to see the reflected ray. Bring the paper back to the original position. When the whole sheet of paper is spread on the table, it represents one plane. The incident ray, the normal at the point of incidence and the reflected ray are all in this plane. When you bend the paper you create a plane different from the plane in which the incident ray and the normal lie. Then you do not see the reflected ray. It indicates that the incident ray, the normal at the point of incidence and the reflected ray all lie in the same plane. This is another law of reflection. Paheli and Bhoojo performed the above activities outside the classroom with the sun as the source of light instead of a torch. You, too, can use the sun as the source of light. Was the image erect or upside down? Was it of the same size as the object? Did the image appear at the same distance behind the mirror as the object was in front of it? Could it be obtained on a screen? A source of light O is placed in front of a plane mirror PQ. Two rays OA and OC are incident on it. Can you find out the direction of the reflected rays? Draw normals to the surface of the mirror PQ, at the points A and C. Then draw the reflected rays at the points A and C. How would you draw these rays? Call the reflected rays AB and CD, respectively. Extend them further. Do they meet? Extend them backwards. Do they meet now? If they meet, mark this point as I. For a viewer's eye at E, do the reflected rays appear to come from the point I. Since the reflected rays do not actually meet at I, but only appear to do so, we say that a virtual image of the point O is formed at I. As you have learnt already, such an image cannot be obtained on a screen. You may recall that in an image formed by a mirror the left of the object appears on the right and the right appears on the left. This is known as lateral inversion. Imagine that parallel rays are incident on an irregular surface. Remember that the laws of reflection are valid at each point of the surface. Use these laws to construct reflected rays at various points. Are they parallel to one another? You will find that these rays are reflected in different directions. When all the parallel rays reflected from a plane surface are not parallel, the reflection is known as diffused or irregular reflection. Remember that the diffused reflection is not due to the failure of the laws of reflection. It is caused by the irregularities in the r eflecting sur face, like that of a cardboard. On the other hand reflection from a smooth surface like that of a mirror is called regular reflection. Images are formed by regular reflection. Nearly everything you see around is seen due to reflected light. Moon, for example,receives light from the sun and reflects it. That�s how we see the moon. The objects which shine in the light of other objects are called illuminated objects. There are other objects, which give their own light, such as the sun, fire, flame of a candle and an electric lamp. Their light falls on our eyes. That is how we see them. The objects which emit their own light are known as luminous objects. Recall the last time you visited a hair dresser. She/he makes you sit in front of a mirror. After your hair cut is complete, she/he places a mirror at your back to show you how the hair has been cut. Can you think how you could see the hair at the back of your head? Paheli recalls having constructed a periscope as an Extended Activity. The periscope makes use of two plane mirrors. Can you explain how reflection from the two mirrors enables you to see objects which are not visible directly? Periscopes are used in submarines, tanks and also by soldiers in bunkers to see things outside. Take two plane mirrors. Set them at right angles to each other with their edges touching . To hinge them you can use adhesive tape. Place a coin in between the mirrors. How many images of the coin do you see ? Now hinge the mirrors using the adhesive tape at different angles, say 45�, 60�, 120�, 180� etc. Place some object (say a candle) in between them. Note down the number of images of the object in each case. Finally, set the two mirrors parallel to each other. 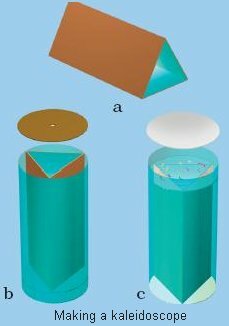 Find out how many images of a candle placed between them are formed. This idea of number of images formed by mirrors placed at an angle to one another is used in a kaleidoscope to make numerous beautiful patterns. You can also make a kaleidoscope yourself. To make a kaleidoscope, get three rectangular mirror strips about 15 cm long and 4 cm wide each. Join them together to form a prism as shown in. Fix them in a circular cardboard tube or tube of a thick chart paper. Make sure that the tube is slightly longer than the mirror strips. Close one end of the tube by a cardboard disc having a hole in the centre, through which you can see. To make the disc durable, paste a piece of transparent plastic sheet under the cardboard disc. At the other end, touching the mirrors, fix a circular plane glass plate. Place on this glass plate several small pieces of coloured glass (broken pieces of coloured bangles). Close this end of the tube by a ground glass plate. Allow enough space for the colour pieces to move around. Your kaleidoscope is ready. When you peep through the hole, you will be able to see a variety of patterns in the tube. Interesting feature of a kaleidoscope is that you will never see the same pattern again. Designers of wallpapers and fabrics and artists use kaleidoscopes to get ideas for new patterns. To make your toy attractive, you can wrap the kaleidoscope in a coloured paper. 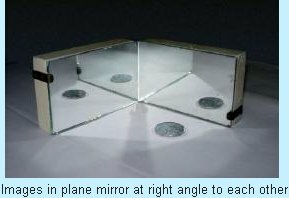 Get a plane mirror of suitable size. Place it in a bowl (Katori). Fill the bowl with water. Put this arrangement near a window such that direct sunlight falls on the mirror. Adjust the position of the bowl such that the reflected light from the mirror falls on a wall. If the wall is not white, fix a sheet of white paper on it. Reflected light will be seen to have many colours. How can you explain this? The mirror and water form a prism. This breaks up the light into its colours. 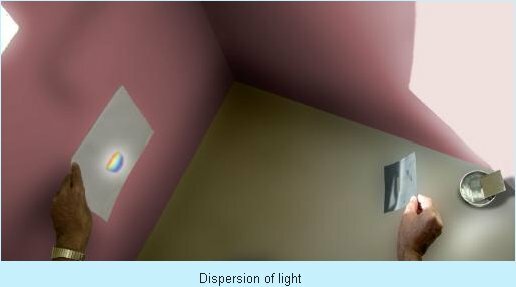 Splitting of light into its colours is known as dispersion of light. Rainbow is a natural phenomenon showing dispersion. In previous class, you learnt that the sunlight is referred to as white light. You also learnt that it consists of seven colours. Here is another activity showing that sunlight consists of several colours.